WTOP reports that speed cameras located on Suitland Road in Morningside have been removed after Morningside and speed camera contractor Brekford agreed not to renew their photo enforcement contract which was due to expire. The town has stated their intent to find a new vendor. "We are interviewing other possible vendors. Brekford did a great job," says Morningside Town Attorney Todd Pounds in an email to WTOP. The town has had to face a number of tough questions about their speed camera program. WTOP had asked Morningside though a public information act request for documentation that they had advertised their speed camera sites prior to activation, a requirement of state law. The town also faced criticism for having deployed the cameras despite the fact that the county actually denied their request for permission to place the cameras on a county road. Morningside claimed that the county did not reply quickly enough to deny the request and deployed the cameras anyways. 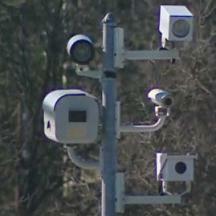 Some motorists also disputed the accuracy of the cameras with videos, according to a prior WTOP report. One motorist reported earlier this year that Morningside failed to even appear at a hearing where she was disputing a ticket, which was overturned as a result. Last year the editor of the Maryland Drivers Alliance website filed a public information act request for calibration records from the town's cameras, both daily setup logs and annual calibration certificates. State law requires such records to be "kept on file". Town Attorney Todd Pounds responded that the town was not required to maintain such records because "Morningside is not the speed monitoring system operator". We subsequently filed for judicial review to obtain the records. In April of this year the judge directed that a subpoena be issued to contractor Brekford o produce the records we requested. Brekford did comply with the subpoena and was able to produce most of the documents in the initial request. The subpoena revealed that on a few days within the range of dates we requested no daily setup logs could be found in Brekford's records, even though they had indicated that citations had been issued. The documents also revealed that several cameras which had been used in the town previously had been issued annual calibration certificates by the manufacturer. State law requires that devices be certified by an "independent calibration laboratory". Using manufacturer certifications for the first year is a practice which has taken place in other speed camera programs and which has drawn criticism the past as violating the intent of state law. This is an issue which was specifically debated by the state legislature over the past two years and determining whether this had taken place in Morningside was part of our reason for the original request. 1. As you previously have been informed, the Town does not, and is not obligated to, maintain the logs pursuant to this request. 2. Morningside does not issue citations, thus, does not maintain documents pursuant to this request. 3. The Town of Morningside is not the systems operator as defined in that statute. Despite this assertion, citations issued by Morningside are clearly labeled as coming from "Town of Morningside Police Department". Daily setup logs produced by Brekford have shown that they are clearly labeled as "Town of Morningside, MD", not "Brekford Corp", and bear the town of Morningside's seal and the signature of a Town of Morningside employee. This demonstrates that Morningside clearly had access to the system where the documents we requested are stored, and that the documents they denied having are public records created by and belonging to Morningside's speed camera program. The attorney for Brekford Corp was more forthcoming witbh straight answers than Morningside has been. When asked "Have employees of The Town of Morningside been given access to a database or file system where items 2 and 4 are stored? Specifically, is there a web site, application, or similar system through which such records can be accessed by authorized employees of Brekford's client?" Brekford's attorney Matt Schroll replied via email "Yes. Trained and certified representatives of the client have direct access to this and all information provided in response to your subpoena." This would seem to indicate that Morningside was entirely capable of complying the Maryland Drivers Alliance's MPIA request at any time in the past eleven months had they chosen to be transparent.